This is such an adorable book! I was attracted by the cover, as usual. In this case, the lead character’s direct stare and glasses made it stand out amidst all the happy shoujo couples that are on most other covers. I like how she is sort of hunched over her desk, as if she is letting us in on a secret. 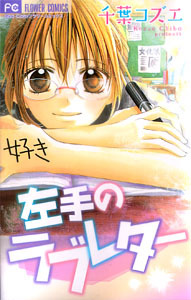 Also, I don’t think there are all that many shoujo manga heroines with glasses, the guys are more likely to have them. In this case, out of the five one-shot short stories in this book, 2 of them feature a heroine with glasses. The art style is clean, uncluttered, and attractive. The little illustrations between the chapters are really pretty. The guys in these stories are nice in that they aren’t cruel or mean to the girls, but they aren’t perfect cardboard cutouts, either. I just realized that I have several other one-shot books by this author, but this is the first one I have talked about here. I will need to cover her other titles soon too, because they are just as cute as this book. The first story is about a girl named Nishino who has a one-sided crush on the boy who sits next to her in class. His name is Minami, and he is handsome and popular. He always seems to be surrounded by friends, but in spite of this , he still greets her by name. Nishino considers herself to be average and plain, and generally beneath the notice of such a great guy like Minami, so she is thrilled that she gets to sit next to him. That connection is enough. But then one day, Minami notices the notes that Nishino writes to herself on the back of her hand. It is generally stuff about what errands she needs to run. Minami finds the notes to be really amusing, and he soon starts writing things on his own hands and showing them to her. To Nishino’s amazement, they soon begin to have secret conversations in class by writing on their hands instead of passing notes. Minami is really nice, and seems to be really interested in what Nishino has to say. But what chance does an average girl like Nishino have to catch such a sweet guy like Minami? Even his friends have no problem telling him that she is plain, and they can’t understand why he is with her. What can Nishino do? Story 2 is about a pair of childhood friends who have drifted apart. When they were children, Sorato-kun and Tomoko-chan were very close, and would often have great fun at a local amusement park for children. The place was really really small, but it had fun rides, and a great ferris wheel that they loved to ride. But that was long ago. These days, their relationship is very impersonal. It has been 10 years since they were that close. This is strange, since they still live next door to each other, but for some reason they drifted apart. Then one day, Tomoko finds an ad for that same amusement park. Wow, it brings back so many memories! But to her dismay, the ad says that the park is going to close down! Tomorrow is the last day it will be open. This news has a really strong impact on Tomoko. All of her memories with Sorato fill her mind, and she just can’t let them go. She gathers up her courage and goes next door to ask him if he knows about the park closing. He looks surprised to see her at his door, but he admits that he is aware of it. For some reason this makes Tomoko sad. She is about to give up on Sorato and return home, when he invites her to go with him to the park for its final day. Will they be able to recapture their lost closeness? Story 3 is very silly, yet very cute at the same time. Our heroine, Saya-chan, should be happy. After all, the guy who received her love letter is accepting her feelings and agreeing to go out with her. However, there is one small problem — it’s the wrong guy! Agh! Poor Saya managed to put her love letter into the wrong locker, and has thus confessed to the wrong guy! She meant to give the letter to her beloved Aida-sempai, but instead it was received by Sahara-kun. Sahara is also really cute, but not in that “shoujo-manga-prince” sort of way like Aida. Sahara is more of a cool and athletic type, and works hard at playing basketball. He can be scary sometimes, and blunt, but he says what he means, and values honesty. After realizing how dedicated Sahara is to his sport, and spending more time with him. Saya begins to fall for him. But what will happen if he realizes the truth about her confession? It turns out that this guy is named MIYAMURA Shio, 20 years old. He is an artist, and he was just advertising for another model for his work. He didn’t mean anything sinister or perverted by trying to get her to remove her clothes. (I think, perhaps, he would be better off NOT trying to undress middle school girls though….) Anyway, Mina was desperate for money before… now she is even more desperate because she damaged one of his paintings! Fortunately, Shio still offers Mina a job at his studio. but as a maid/assistant, NOT a model. But with all these beautiful nudes around her, and a guy who thinks she would make a GREAT model, how long will Mina be able to resist?